Welcome to West Wales Riding Club! 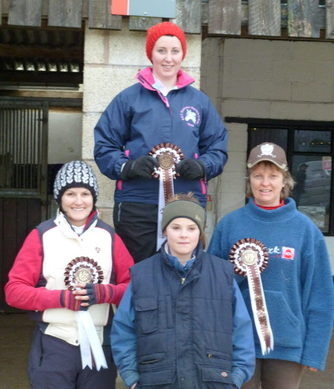 West Wales Riding Club is a BRC affiliated club in Area 21 for riders over 18 years of age. It is based in Pembrokeshire and has been in existence for some fifty years. We hold Dressage and Show Jumping competitions throughout the winter as well as running weekly training rallies all year. Our members have been successful at National Championships. In 2016 our Novice Show Jumpers won the KBIS Winter Show Jumping National Championships (see below for photo). The membership year runs from 1st October each year -form available for download from the download page or further down this page. A new link has been added to the Links Page for a web site called 'matchyhorsey'. This gives guidance on how to present horses in Showing Classes. PLEASE GO TO THE EVENTS PAGE FOR DETAILS OF WWRC COMPETITIONS AND AREA 21 QUALIFIERS AND TIMES FOR DRESSAGE COMPETITIONS. Training Rallies will continue throughout 2018 and 2019 on Monday evenings at Moor Farm. Open to WWRC Members only. A download giving details is available here . The Club's 'year' runs from 1st October each year. Please send your Renewal Form and fee to our Membership Secretary asap. This is particularly important if you wish to compete in one of the Area 21 Competitions as only fully paid up members whose names have been notified to BRC HQ can compete in them. A Membership Application Form for the year 1st October 2018 to 30th September 2019 is available for download here. Please note that payment can now be made by Bank Transfer. However, for security reasons, details of our Bank Account are not shown on the form. CONGRATULATIONS: to the Novice Show Jumping Team consisting of Kate Gillam (Lilly Langtree), Katie Mathias (Penty Parc Stormy), Lucy Jowett (Penty Parc Isidro) and Gemma Butcher (Denmor Roallan (Robo)) for winning the KBIS Senior Novice Show Jumping Winter National Championships 2016 held on Saturday 9th April 2016 at Keysoe, Bedford.